Yuri is My Job! Vol. 2 Review – AiPT! 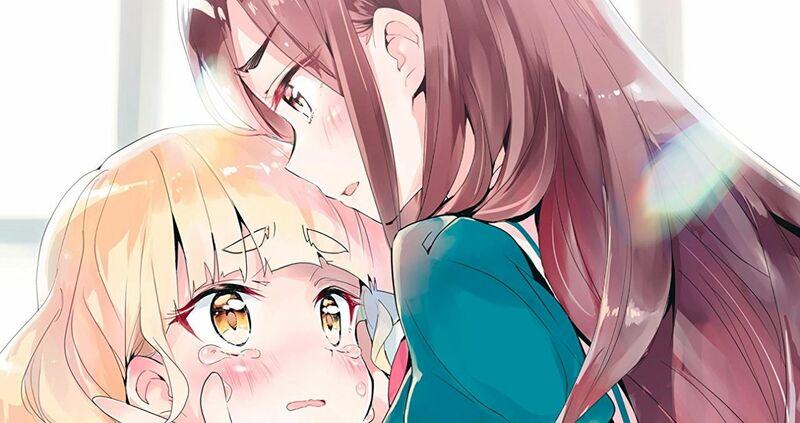 When I read the first volume of Miman’s Yuri is My Job!, I found it to be a solid introduction to the series. The setting is a unique one, with high school girls working at a theme cafe in which they must pretend to be students at a private academy. They must also act as if they’re all great friends, and in some cases even Schwestern– the academy’s term for its closest pairs of girls. The conflict arises, of course, from how far this all is from the truth. This volume chronicles the fallout that occurs when one of the cafe’s newest employees, Hime, realizes that she’s met her co-worker Mitsuki before– and their encounter did not end well. How does Miman handle this development? Is Yuri is My Job! Vol. 2 good? This volume’s first chapter is excellent. It’s one long flashback to Hime’s childhood back when she first met Mitsuki, who she then knew as Yano. Hime was a new student at Yano’s school, and she quickly noticed how poorly the other students treated Yano. Always striving to be liked by everyone, Hime attempted to befriend both Yano and her bullies, telling a series of lies to both sides in order to preserve her social standing. The character development here is great, and it adds a lot more depth to what was a very generic rivalry back in Vol. 1. Miman does a great job depicting the complicated social lives of anxious grade school students without treating any of the parties involved too judgmentally. There are lies aplenty but there’s sincerity too, and both Hime and Mitsuki come out of the chapter a lot more nuanced and likable than they were before it. The rest of the volume is less consistent. The middle portion is still good and has solid pacing as Hime and Mitsuki navigate the uncertain state of their relationship. A lot of attention is paid to how the pair’s interpersonal tensions affect not only themselves but their workplace, from their co-workers to the customers. This acknowledgement is nice since it’s more or less the only considerable page-time the supporting cast gets; this volume revolves almost entirely around Hime and Mitsuki. Unfortunately, the volume’s last quarter or so is weaker than its beginning. These final few chapters are rushed, with characters’ actions feeling more plot-driven than like natural results of their motivations and personalities. As a result, the resolution to the main conflict feels unearned. Miman’s art throughout is good, though not especially notable. Its strongest aspects are definitely the characters’ facial expressions and body language. Hime and Mitsuki have very intense reactions to everything around them, and the art reflects that very effectively. Mitsuki’s faces are especially telling, as we get to see how starkly her attitude toward and treatment of Hime shifts across time. The page layouts are also well-balanced and there aren’t many clarity issues. It’s always clear what Miman is going for, and there are pretty shojo patterns aplenty. With that said, there aren’t a lot of details that’ll knock your socks off. It just feels like something’s missing. The visuals don’t have quite enough creativity or commitment to the manga’s more over-the-top elements to bring out the very best in the story. Overall, Yuri is My Job! Vol. 2 is an enjoyable book that greatly impresses in the beginning but then shoots itself in the foot towards the end. The opening flashback frames Hime and Mitsuki’s mutual antagonism from a whole new perspective that helps flesh them both out greatly as characters. The art also helps convey the tone effectively and the characters’ facial expressions and body language are great. Unfortunately, the second half drops the ball a bit by rushing the conflict resolution and making it seem unearned. With that said, I still intend to keep up with the series and see where it goes from here. Yuri Is My Job! Vol. 2 is an enjoyable book that greatly impresses in the beginning but then shoots itself in the foot towards the end.